Glen Alps’ serigraph titled “Two Figures” is among the prints shown in the Territorial Hues exhibit at Cascadia Art Museum. Cascadia Art Museum curator David Martin’s book “Territorial Hues” catalogs prints from 1920 to 1960. EDMONDS — I remember my shock as a kid in the 1970s when I figured out that most people in New York City still thought of the Northwest as a bunch of culturally backward logging towns. The reality is that since its territorial days, Washington has been home to talented artists (many are unrecognized women) who were inspired by our waters, mountains, wildlife and the brilliant Coast Salish influences of our region. Maybe some of us believed in our cultural shallowness, too, because the strange thing is, lots of those early artworks had been virtually hidden until a guy schooled in the theory of regional art moved to Seattle and started digging. The exhibit, which opens today, is one that even the most true-blue Northwest art fans have not seen before. It is of prints that display the cultural and stylistic influences used by Washington artists to produce works that reflect the color, light and atmosphere particular to this region. The exhibition and book focus on several mediums, including color woodcut, intaglio, serigraphy (silk screening) and lithography. The influences of Japanese prints, Native American arts and regional appropriations of international movements — arts and crafts, modernism, abstracts — are examined, along with the local production of white-line, or Provincetown, prints. If you love the Northwest and Northwest regional art, be sure to check out Territorial Hues. The museum continues to prove that there was more to the early Northwest regional art scene than Mark Tobey, Morris Graves, Guy Anderson and Kenneth Callahan — the men that Life magazine called the Northwest mystic artists. The museum’s show is divided into four rooms. Start with the monoprints, learn about the Provincetown method and the local connection to Japanese prints. Get a look at Glen Alps’ abstract collagraphy, Elizabeth Colborne’s trees and Helmi Juvonen’s Coast Salish-inspired work. 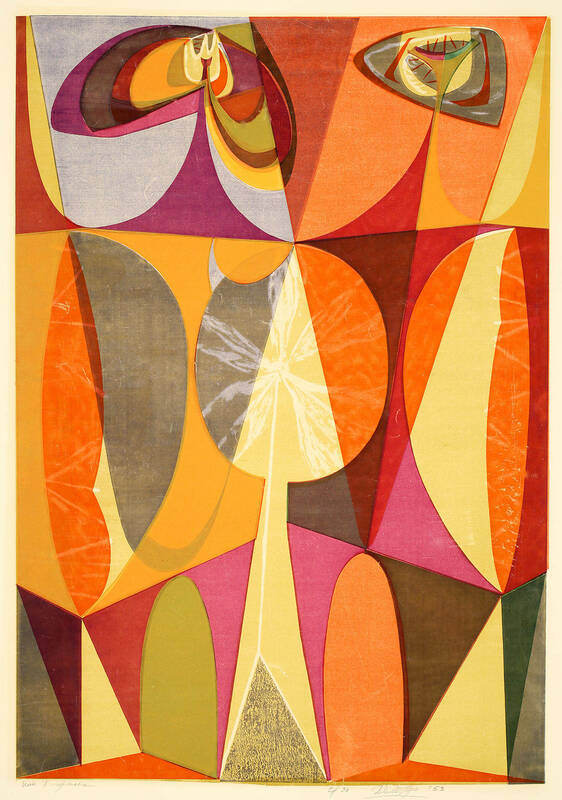 Other print artists represented include Frances Blakemore, Elizabeth A. Cooper, Lance Wood Hart, Robert Bruce Inverarity, Dorothy Dolph Jensen, Ruth Penington, Danny Pierce, Elizabeth Warhanik, James Washington Jr., and many more. Martin’s investigative talents include finding families who preserved memorabilia from their artist relatives, along with the wood blocks used to make these prints. Many blocks are displayed alongside the prints. In some cases, more than two dozen wood blocks were carved and used to make one color print. The final room features the work of Bohemian brothers Waldo and Corwin Chase, who spent much of their lives on the Olympic Peninsula. Martin has incorporated photos of these handsome men and examples of prints that kept them in business. Cascadia Art Museum continues to chip away at the notion that the Northwest was behind the times until the 1970s. People in New York City have figured it out. It’s a history that should be valued, and at Cascadia it is. Territorial Hues continues through Jan. 7. Cascadia Art Museum is open 11 a.m. to 6 p.m. Wednesday through Sunday. On third Thursdays, the museum is open until 8 p.m. and is free during Art Walk Edmonds hours, 5 to 8 p.m. Museum is at 190 Sunset Ave., Edmonds. Admission is $10, with discounts for seniors and students. Call 425-336-4809. More is at www.cascadiaartmuseum.org. Audio tour guides are now be available at the museum. As you tour the exhibit, listen to notes about the artists and descriptions of printing processes. Guides are free for members, and $5 otherwise. “Summerland” by Corwin Chase is a color woodblock print from 1929.